Stacey: And always remember, they've got the whip hand. Smith: Do you know what I'd do if I had the whip hand? I'd get all the coppers, governors, posh whores, army officers and members of Parliament, and stick them up against this wall and let them have it, because that's what they'd like to do to blokes like us. The movement known as kitchen sink drama is going to be lost on most American audiences these days, but at its heart, it isn't too difficult to understand, focusing as it does on lower class characters set in stark contrast to the establishment, which in class-conscious England meant something more pernicious than it does here. Tony Richardson's The Loneliness of the Long Distance Runner is part of that movement, and it remains a classic example of fighting the powers that be, even when that fight is foolish or self-defeating. When we first meet Colin Smith (Tom Courtenay), he's being taken to a borstal (essentially a juvenile reformatory) having been arrested for theft. After displaying some talent at distance running, Smith attracts the attention of the governor (Michael Redgrave), who, having arranged a sports competition with a local private school, wants Smith to win the cross-country race. While Smith is in training, we learn about what led to his being sent to the borstal. When the race is finally run, Colin is forced to decide who he is really running for, and why, a decision that will shape his future. As the central character, this is Courtenay's show, and he makes the most of it. His thin, pinched face, looking older than it should for a character of that age, hammers home the reality of Colin's life before we've even learned much about it. He makes Colin difficult to either admire or dislike; his actions are motivated by factors anyone would find hard to deal with. As the borstal governor, Michael Redgrave isn't a one-dimensional villain, but he isn't exceptionally nuanced either; the character is generally committed to helping the young men under his control, but like the rest of the administration, his understanding of the changing world of young England is sadly lacking, leaving his efforts destined for futility. Even the new staff member schooled in the latest psychology simply doesn't understand, as his session with a clearly bemused Courtenay highlighting this to humorous effect. As time has passed and the days of the kitchen sink dramas have passed, I'm curious as to whether attitudes toward the film have shifted away from viewing Colin's final act as a positive one, to instead viewing it as selfish and pointless. I suppose that's the divide within the film for viewers; Colin's choice at the end of the race may represent his stand against what he sees as the thumb of authority trying to squash him, but it's also a potential death knell to his chances of success. When he leaves the borstal, he'll be back where he was in a dead end, instead of using his athletic talent to escape and earn an honest living. So which is it? Is he a hero or a fool? Both, really, but which side you lean toward will likely determine how you look at this film. Image Transfer Review: Originally screened at 1.66:1, the transfer on this disc is framed at something closer to 1.78:1, but the difference appears negligible in terms of framing. The film's beautiful black-and-white photography looks excellent, though not immaculate, in this transfer. Audio Transfer Review: The original mono is your only option, and it seems to have suffered from the technology of the time, as it's somewhat muffled and dull during dialogue, but usually okay for the score. Extras Review: The trailer is on hand, but that's it. Amusing note: the quote leading this review is featured in the trailer, and "posh whores" is removed from it, considered perhaps too saucy for general audiences. How times change. Large, easy to read English subtitles are hand in case the northern English accents prove too much. Warner's DVD isn't anything special in terms of extras or presentation, but the film itself more than makes up for anything else that might be lacking. 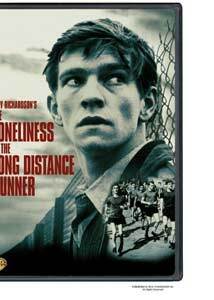 A potent drama of working-class anger and frustration in early 1960s England, Tom Courtenay started his career in style with a star-making turn as the troubled Colin Smith.